Dr. Sudore is a geriatrician and palliative care physician whose presentation outlined the health literacy issues related to informed consent and advance care planning and presented some lessons learned from creating these forms for patients. She also talked briefly about web design for advance care planning sites. Dr. Sudore reviewed the basics of creating clear written materials, including use of white space, short sentences, avoiding jargon, grouping information, etc. She talked about design elements, such as use of pictures that improve comprehension. She also talked about various readability testing tools available. 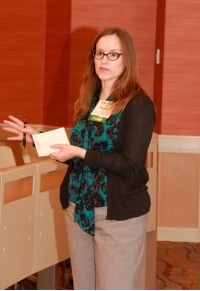 She reviewed the components of Informed Consent forms as set out in the AHRQ Toolkit. On the subject of HIPAA forms (and how to get your organization to allow you to change them), she recommended sharing examples of easy-to-read HIPAA forms being used by other healthcare organizations. Dr. Sudore went on to talk about Advance Directives, “the ultimate informed consent forms.” She showed us the California Advance Health Care Directive form she participated in developing, which is currently available in 10 languages. She talked about how it was developed and how versions for other states are in development as well. She expressed interest in partnering with groups working in more states to develop these forms. She cited studies of existing advance care directives that had shown that 70% of patients’ documented end-of-life wishes were wrong. In studies where the focus was on discussing the patients’ wishes, there was a 90% consistency of care with the patient’s goals, as well as greater satisfaction for the patient and their surrogate, and increased cost savings and quality of care. The studies showed that, just because someone signs something, it doesn’t mean they understand it, and that it is important to confirm understanding through discussion. Dr. Sudore recommended that the first step in preparing the advance care directive is to find out what matters most to the patient. Most patients don’t care what the treatment is; they care what the outcome of the treatment will be. Family and religious values are important here, as well as other cultural factors. Visual images and stories make powerful teaching tools in bringing issues and questions to light. Video images and stories improve understanding, increase engagement, decrease decisional conflict, and help identify goals. She introduced us to the PREPARE website, which her team developed. The team included health literacy, geriatrics and palliative care and behavioural experts, and used 13 separate focus groups for feedback. The team also conducted cognitive interviews with patients. The site uses simple, active language, high-contrast, video instructions for using the site, voice-overs and closed captioning, and lots of videos, many of which model behaviour, demonstrating how to plan for health care. (The site avoids the use of terms like “death” and “end-of-life,” which can be frightening for patients.) She emphasized the importance of pilot testing such a site with the target population, as well as improving it over time. Dr. Sudore’s presentation was packed with useful insights about the difficulties patients and practitioners face in reaching “informed consent” and strategies for overcoming them. One of the most important take-aways was that written forms, no matter how well designed and written, cannot function to obtain truly informed consent on their own. Visuals, stories, and, most important, discussions with patients and families that include teach-back, are key to truly informed consent and advance care planning.